Our Rental fees are ALL INCLUSIVE - no hidden costs. Your cozy and beautifully decorated holiday home is located at the historical Yachtclub district of CC. Both beaches are only 0,8 miles away (bike paths, too). Relax in the large heated pool, enjoy BBQ and a nice cocktail on the well-kept lanai or play badminton or bocce in the garden area which is surrounded by a hedge for undisturbed relaxation. We also offer WiFi, cable TV, GPS for your rental car, 5 bikes, bike-carrier for toddlers, kayaks, tennis- and golf equipment for our guests. Also we provide all beach equipment you need (towels, chairs, umbrellas, beach-stroller and more). Just bring yourself and enjoy! The Nest is centrally and securely located in the southwest Yacht Club area of the lagoon city, Paradise Nest is a perfect starting point for all activities that make the tropical life on Florida's Gulf Coast so unique. Cape Coral Beach with its fine sandy beach, pier, Boathouse-Bar and marina can easily be reached in just 2 minutes as well as South Cape beach. It takes you only 20 minutes to get to the sprawling dream beaches of Fort Myers, Sanibel Island or Lover's Key. Just around the corner you will find different yacht and boat rentals, public tennis courts and much more. Shopping, golf, tennis and restaurants are within walking distance. Our guests are attended by our reliable and friendly local HOUSE SERVICE. They speak English, German and Italian. You will also receive a personal introduction to your holiday home so you can enjoy your holiday. We have bought our family nest in July 2011 and made our longtime dream come true. After lots of work and remodeling we now call it PARADISE NEST and hope our guests will love it as well as we do. The house is well above the standard in this price category and we chose high quality in furnishing and equipment. The beautiful beaches of Cape Coral Beach with the pier and romantic Sunset Celebrations and the new South Cape Beach on Bimini Basin are only minutes away from our nest and easily accessible by bicycle or on foot (0.8 miles.). Parking is free on these two beaches and there are also shaded children's playgrounds available. We use our 'nest' as a family ourselves, and therefore took much care on comfort and design. Natural stone flooring in the living room and bathroom, high quality (suitable for allergy sufferers) carpeting in the bedrooms, high quality furniture, real wood fitted kitchen with full-height fridge-freezer and ice maker for cool drinks and cocktails, stainless steel appliances. In the living area, a 127 cm large flat screen with cableTV and PS 2/DVD is available for our guests. Large (125 cm and 81 cm) LCD TVs are also in the bedrooms, Netbook / WiFi, GPS etc. 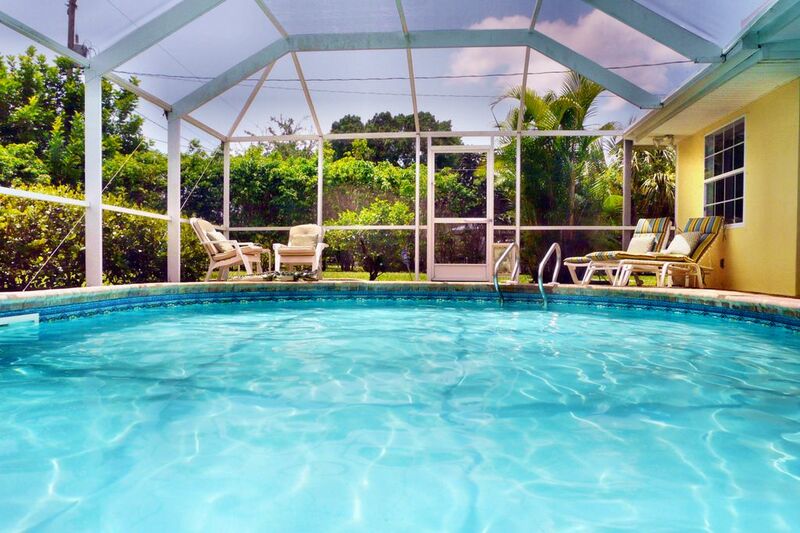 The screened pool area will protect you from mosquitoes on warm summer evenings. Pool and terrace are facing south (all-day sun, covered patio with fans). The lanai is lined with elegant stone paving and a skin-friendly pool-bromine system is installed, heatable (electric) in winter. An electric grill is also here for enjoyable BBQs. POOL MEASURE: Depth 3 ft 11 in to 5 ft 2 in. Length approx. 18 ft , Width approx. 26 ft. RECREATIONAL ACTIVITIES: Your vacation home is safe and centrally located in one of the best residential districts of Cape Coral, the historical Yachtclub-area Caloosahatchee. The immediate vicinity of the marina, downtown and many restaurants and shopping centers will inspire you. In Paradise Nest you will find peace and relaxation, yet you are within the city with all its amenities and amusements. Romantic canals and bajous, broad palms and mature trees invite you to stroll along or having a picnic, or watching the many exotic animals here. For boat tours, we recommend a reliable rental just around the corner. After an introduction (only drivers license required) you can float along the waterways of the Caloosahatchee river or visit the carribean islands of dreams Sanibel, Captiva or Gasparilla Island. Usually you will be accompanied by dolphins in the ocean - just amazing! Very nice tennis courts can be found at Cape Coral Beach Marina as well as more than 30 golf courses. TOURS AND SHOPPING: For extensive shopping trips, the nearby Edison Mall in Fort Myers is just the right place, as are the various Outlets. Here you will find Top-products, electronics and Designer clothes at sensational prices. For culture lovers there are great little theaters, jazz clubs, museums and much more. We will gladly give you details of this information. Worth a visit are the property of Thomas A. Edison, the genius inventor, and Henry Ford, the automobile visionary. Not only the gardens are visual delights. Cape Coral is centrally located in Southwest Florida that most attractions can be visited as day trips. The theme parks in Orlando can be reached in about 2.5 to 3 hours. Tampa with its many museums (Dali) is like Miami only about 2 hours away, as are the Indian reservations and the Everglades. Cape Canaveral can be reached in an 3.5 hours drive. Or you take the speed boat to Key West (3 hours). Or you go by car and enjoy the fantastic journey across the Overseas Highway,! Bianca - we are looking forward to your visit! About Bianca - we are looking forward to your visit! We live with our kids and a lot of pets in Bavaria, Germany. Andy works as a federal agent for migration and refugees whereas I, Bianca, keep on my phantasies and do professional art-pottering. Our children just started their training and attend university. In buying the 'nest' we made a longtime dream come true and we are happy to share this dream with you! For more than 20 years we visited Southwest Florida on vacation. Endless shelling-beaches, water the colour of tourquoise, playing dolphins and manatees and an exotic fauna and flora... that´s what we need to let our souls spread their wings. We love the people in Cape, their friendliness and open-minded attitude and feel very much at home here. View more about Bianca - we are looking forward to your visit! The bathroom was completely remodelled in summer 2011 as well as the whole house. Natural stone tiles, mosaic tiles with real glass shower and a sink with granite top are part of the equipment. Hand and bath towels are provided for your convenience, along with two hair dryers, also shower gel and shampoo basic equipment. Children and teens are always welcome in our vacation home! For the youngest guests there are two folding beds for children which have an integrated changing table in the house, also one high chair. Caution - our pool area is not secured! On the patio doors we have attached switchable sensors for alarm when opened by the children. Paradise Nest has a separate laundry room with washer and dryer. Iron and ironing board are also available. Thank you, Pamela and Anthony for your kind rating! We appreciate it very much. So glad that you enjoyed your stay at the Nest and loved the area. The sunsets at the Yacht Club beach are a true gem to enjoy. Whenever you like to come back to the nest, we´d be more than happy to be your host again. Home was very cute, cozy and relaxing. Very clean home. Beds were comfy, shower was great and the pool area was awesome! Would highly recommend this home. Thank you, Heather, for your kind response. You are always welcome at the nest. Wir waren im April 2018 vier Wochen Gäste im Nest und haben uns vom ersten Tag an sehr wohl gefühlt. Das Haus war sehr sauber, super ausgestattet und es hat wirklich an nichts gefehlt. Vielen Dank an Bianca und Andy für den sehr guten Service und die sehr freundliche Kommunikation. Wir würden das Nest jederzeit wieder buchen. Liebe Susanna, Jürgen, Laura & Kevin, vielen Dank für Eure tolle Bewertung, wir können das Kompliment nur zurückgeben. Sehr nette Gäste, die wir gerne wieder bei uns haben. We enjoyed our stay at Paradise Nest. The lanai and pool were a highlight for us. The bed comfortable and the kitchen well equipped. If you are an avid cyclist I would recommend bringing your owe bike. Regarding the location- the Yacht Club and Boat House area is great for a meal, to watch the sunset and to just relax. The beach there is small but is a good alternative when the traffic is heavy going to Fort Myers Beach or Sanibel Island. Two grocery stores are close by, other shopping is about 20 minutes to 30 minutes over the bridge into Fort Myers. Thank you, Dora-Lynn for your kind response, we appreciate it very much. Thanks for your understanding that we can only offer standard bikes for our guests, since we have to change them every few years. Those bikes are meant for nice tours around our area - and we love the bike paths to the beach and to CC Farmers Market. We hope, you will decide to stay with us again, you are always welcome at the nest. Our staying was perfect, the home has all you need for your vacation and the location is quiet and useful. Bianca was an attentive and careful host. Mille grazie, Eleonora and family, we were very happy to have you. Thank you for your positive review, we appreciate it very much. You and your family are always welcome back at the nest. Thank you, Louise, for your recommendation. We appreciate it very much and were glad to be your host during your "winter escape". You are always welcome at the nest. The "nest" is located at the saught-after Yachtclub area, just minutes away from the beach. At Cape Coral Beach you will find the lively Boat House Bar (drinks and snacks, live music), tennis courts, childrens playground and the Yachtclub. In the evenings you can enjoy a wonderful Sunset under palmtrees. Cape Coral Beach and South Cape Beach (at the Bimini Basin), Shopping, Dining and more are accessible within walking distance or you can use our bikes. Cape Coral, the 'Venice of America' has a lot more to offer than just beautiful beaches and healthy climate: attractions such as the Edison-Ford Winter Estates, Manatee World, Flea market, cinemas and restaurants are also within easy reach, such as shopping outlets and the beautiful islands of Sanibel and Captiva. Swimming, golfing, fishing, snorkeling, boating or hiking through mangrove forests will give you unforgettable holiday memories. Theme parks like Disneyland, Sea World and Universal Studios in Orlando are within easy reach (highway about 2,5 hours). We also recommend a trip to the Keys down to the southernmost point of continental U.S., Key West, where Hemingway used to live. Also worth a visit are Cape Canaveral and the Ringling Museum of Arts in Sarasota. The city of Miami attracts visitors with glamor and JetSet (2 hours). Visit the Everglades and take an airboat ride in over the 'sea of grass'! Golf: GOLF: In your neighborhood you will find beautiful golf courses, the choice is immense. Just in Cape Coral and Fort Myers, you have more than 30 excellent golf courses available. You will receive a detailed list of public golf courses along with our specialized guest infos after booking. PHYSICIANS: A list of renowned physicians - just in case - you will also receive along with the guest infos. The peninsula of Cape Coral is the second large city in Florida and extended over many square miles, so that in some locations the sights and wonderful beaches of Cape Coral, Fort Myers Beach, Sanibel and Captiva Iceland are more than an hour's drive away. At 'PARADISE NEST' this is not an issue - short distances - long fun! If you want to have a birds-eye look (also streetview) on our 'Nest': Please use maps.google.com and add our address: 714 Sharar Court, Cape Coral, FL. There you can also take a look at the surrounding area and the short way to the beaches (Yacht Club Community Park) and South Cape Beach (Four Freedoms Park). We are happy to offer advice and assistance in planning your most enjoyable weeks of the year - with lots of insider tips on attractions, beaches, nightlife, shopping and more ... We are looking forward to having you as our guests! Ski: Oooops - there is no snow in Florida - but WATERSKIING in January while a nice breeze caresses your skin and the sun is shining on a cloudless sky... amazing fun! Watersports of all kinds, Bananaboat, waterskiing, wakeboarding and more you will find at Fort Myers Beach, just 20 Minutes away from your vacation home Paradise Nest. Die angezeigten Preise sind ALL INCLUSIVE und beinhalten neben dem Mietpreis: - 11 % Tourist- und Sales Tax des Staates Florida - Endreinigung (150 €) - kostenloses Navi für Ihren Mietwagen für die Dauer Ihres Aufenthaltes - Strom (bis Verbrauch 30 €, bisher stets ausreichend), Wasser, W-Lan, Telefon (Ortsgespräche), Kabel-TV, Pool- und Gartenpflege, elektrische Poolheizung/Winter, Amenities - persönlicher Haus-Service vor Ort Der Mietpreis gilt für 2 Gäste, weitere Gäste 10 € pro Person/Tag Kinder bis 12 J. wohnen selbstverständlich kostenlos. Mindestbelegung 2 Gäste Gerne senden wir Ihnen unverbindlich unseren detaillierten Mietvertrag. Bitte beachten Sie unsere dort aufgeführten Stornoregelungen. Haben Sie besondere Wünsche oder Fragen? Wir stehen Ihnen selbstverständlich jederzeit mit vielen Insider-Tipps und Florida-Erfahrung zur Verfügung. Our rates are ALL INCLUSIVE and include besides the rental price: - Tourist- and sales Tax (11 %) - Final clean-up (165 $) - GPS for your car - Energy (up to 40 $ per week, so far always sufficient), water, WiFi, phone (local calls), cable-TV, pool- and garden-maintenance, electric poolheating (Nov.-April), amenities, - house-service whenever you need assistance The rental rate is for 2 guests, each other guest 10 € per day/guest Our "little ones", guests under the age of 12 years stay for free Minimum guests: 2 For further information we will gladly send you our rental agreement. Please note the cancellation conditions listed therein. For further information, don´t hesitate to contact us. Do you have questions, suggestions? We are always here for you and appreciate your inquiry.